After the collapse of the Russian Empire, these three countries became part of the short-lived Trans-Caucasian Democratic Federative Republic. The republic dissolved in May 1918, and Azerbaijan declared independence, which lasted until the Bolshevik Red Army invaded it in April 1920. Georgia and Armenia suffered the same fate and eventually became part of the Soviet Union. With the demise of the Soviet Union, they all have become independent Republics again. 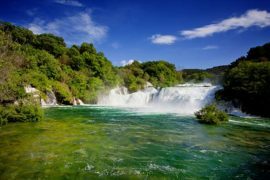 This little known part of the world offers stunning scenery as well as unique history and is ideal for our 14-day tour. 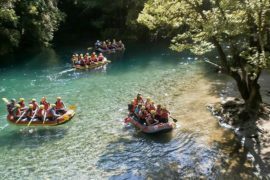 This tour operates with a minimum of 2 and a maximum of 20 travelers. Other group rates are available upon request. This tour is also available for customized dates upon request. Arrive in Baku. Meet and greet at the airport and transfer to your 4* hotel. We start our journey with a Baku city tour with a walk in the beautiful narrow streets visiting historic monuments. Our first stop in the Old City is a visit to Shirvanshahs Palace, the magnificent palace of the Shah. We continue to the Caravanserai where the caravans used to stop on their route from Asia to Europe. Then we walk to the Maiden Tower a UNESCO site forming a group of historic monuments from 12th century. Next, we visit the Carpet Museum where we will see beautiful Caucasian carpets. In the late afternoon we visit the Taza Bazaar and walk along the seaside boulevard. After breakfast, visit the Ateshgah Fire Temple in Surakhany. Once a place of Hindu, Sikh, and Zoroastrian worship is no longer used for any worship. We make a short stop in Maraza to visit the Diri Baba Mausoleum. Next, we continue to the Yedi Gumbez “Seven Tombs”, three of which are still intact. After, we tour the Friday Mosque in Shemakha. Now we depart for Sheki and after arrival start with sightseeing. Visit the magnificent Sheky Khans’ Palace, the local history museum, and Shebeke craft workshop. While in Sheki, a stunning architectural center founded more than 2700 years ago with striking views of the Caucuses; we visit the Sheki Bazaar and a local sweet bakery. Next, we travel to Lagodekhi checkpoint and cross over into Georgia. In Kvareli we a stop for a tasting of some of the best lines in Georgia and enjoy lunch with a local family. We continue to Gremi Architectural Complex which is composed of the Church of the Archangels Gabriel and Michael, a castle and also a bell tower from the 16th century. In the evening we arrive in Telavi. Our first stop is the fortified tiny town of love, Sighnaghi. We walk the cobbled streets of this magnificent little town and enjoy the views of Alazani Valley against the backdrop of the Great Caucasus Mountains. The views are stunning! 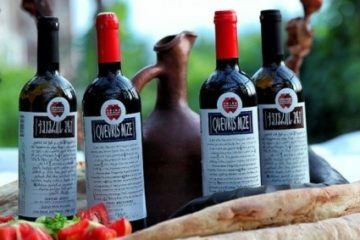 The town is known for its Kakhetian wines that rival the vineyards of France. Enjoy tasting of local wines while we have lunch and participate in bread baking. After lunch we depart for Tbilisi. 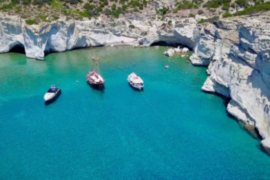 In the afternoon we either have free time or enjoy an optional tour of the Tbilisian 19th century alleys in Sololaki district which was once the district of rich merchants and artists still captivates visitors today. 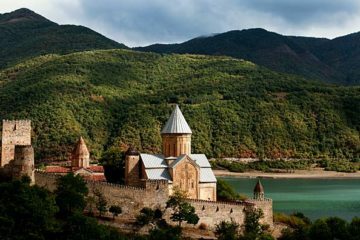 Our Tbilisi sightseeing tour includes the Metekhi Church overlooking the river Mtkvari from the 13th century. More visits include the Sulphur Baths, the Narikala Fortress by cable car, if available, one of the oldest fortifications in the city from the 4th century. Visit an old Synagogue and Sioni Cathedral from the 6th-7th centuries which houses the cross of St. Nino the woman who brought Christianity to Georgia. Lastly we’ll visit the Anchiskhati Church from the 6th century. All these sights mark the end of the Old Town and they are in close proximity for a pleasant walking experience. Afterwards we visit the stunning treasury of the Georgian National Museum before taking a stroll along Rustaveli Avenue, the main street of Tbilisi. We will enjoy dinner with in a family’s home with a masterclass in Khachapuri (cheese pie) and Khinkali (dumplings) preparation. After breakfast, we will visit the ancient capital and religious center of Georgia, Mtskheta which is three thousand years old. 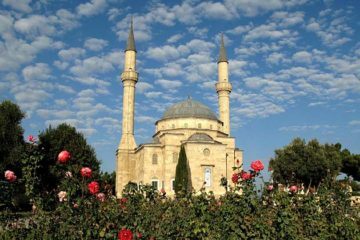 It is considered to be one of the most religious cities in Georgia, being the origin of Christianity in this region and is called the Holy City by the Georgian Orthodox Church which is headquartered here. We continue and visit two UNESCO World Heritage Sites, the Jvari Monastery from the 6th century and Svetitskhoveli Cathedral from the 11th century where the Robe of Christ is buried. The Jvari Monastery was once a Pagan temple until Saint Nino erected a wooden cross on this site. The cross was said to perform miracles which drew people from all over the region. A small church was erected in the 5th century where the cross once stood. Driving along the Georgian Military Highway on the Kazbegien route we will stop at Ananuri a fortified church located on top of Jinvali water reservoir. Enjoy a three hour optional roundtrip walk to Gergeti Trinity Church from the 14th century located at 2170m. Weather permitting; you may catch a glimpse of one of the highest glaciers in the Caucasus, Mt. Kazbegi at 5047m. After we return to Kazbegi we will visit a local master for demonstration of local felt crafting or Teka. We will see how the felt the products are made and enjoy herbal tea while chatting with the master. Afterwards we will visit the Dariali Gorge, which has been fortified since the 1st century B.C., near Georgian – Russian border. Ruins of ancient fortresses still line the gorge today. Today we journey from the Great Caucasus to the Lesser Caucasus to Akhaltsikhe the main town of Samtskhe province. Along the way we will stop and visit the town of Gori the birthplace of Joseph Stalin and the heart of the Kartli region. While in Gori we will visit the Stalin Museum with memorabilia from his time including his private rail carriage. From Gori we will continue to the Uplistsikhe Cave Town founded in the 1st millennium BC which was also an important stop along the Silk Road. Today we cross into Armenia but first stopping Vardzia in the Meskheti province of southern Georgia. Marvel at this thirteen story cave town built from 1186 to 1189 AD by Georgia’s famous Queen Tamara. Queen Tamara reigned from 1184 to 1213 during the Georgian Golden Age. Vardzia stands as a unique example of the Georgian ‘renaissance’ engineering in an area of many medieval sites. Continuing south of Ninotsminda to the border with Armenia at Bavra and continue to Gyumri for overnight to break up the journey to Yerevan. Gyumri is a city of stately Russian architecture, cobbled streets, and a bustling market. We will have an opportunity for sightseeing in the afternoon and again in the morning before departing for Yerevan. On the way to Yerevan we will also visit the Echmiadzin Cathedral, A.D. 301, located outside the city. The cathedral is considered by scholars to be the oldest existing cathedral in the world and was the first built in ancient Armenia. The Echmiadzin Cathedral is viewed as the center of the Armenian Apostolic Church and their most important cathedral. We then travel the short distance to Yerevan, the present-day capital of Armenia, which was the first country to adopt Christianity as a state religion in A.D. 301. The Yerevan of today is a thriving, bustling city of cathedrals, theatres and museums. Yerevan also offers gastronomy, a sophisticated culture of learning and a rich history. We will start our morning with a visit to Mesrop Mashtots Institute of Ancient Manuscripts, which is of prime importance for the study of the history and culture of Armenia, as well as Transcaucasia, Asia Minor and many Middle Eastern countries. Works by some philosophers of antiquity survived only in their Armenian translation. The manuscript collection contains vast materials on the political and socioeconomic history of Armenia and neighboring countries. Not far from Yerevan we will visit two important religious sites. First, we visit the Hellenistic Mithras Temple of Garni, a relic from the pre-Christian era, followed by a visit to the Geghard Monastery in the gorge of the Azat River. The monastery at Geghard is a unique architectural structure, partially carved out of the adjacent mountain and surrounded by cliffs. While the main chapel was built in 1215, the complex was founded in the 4th century. Upon return to Yerevan, our city tour will include the moving Genocide Memorial and Museum at Tsitsernakaberd (“Swallow Castle”). The memorial sits on the site of an Iron Age fortress. The museum’s testimony to the 1915 destruction of the Armenian communities of Eastern Anatolia is moving, and the monument itself is austere but powerful. The spire symbolizes the Eastern and Western branches of the Armenian people. From here the view over the Ararat Valley is striking. This morning we visit the History Museum of Armenia on Republic Square. The square was designed during the Soviet era and consists of five grand buildings built with pink and yellow “tuff”, a rock made of volcanic ash, in a neoclassical style of architecture with heavy Armenian motifs. The museum houses a rich collection of Armenian artifacts which show the evolution of the Armenian people and their culture. We also visit Khor Virap Monastery. Khor Virap has a very long and rich history, both secular and religious. The chapel was originally built in 642 A.D. but over the centuries it has been repeatedly reconstructed. The site’s notability is attributed to fact that Gregory the Illuminator was imprisoned here for 13 years. Gregory the Illuminator was the first official head of the Armenian Apostolic Church and is credited for converting Armenia from paganism to Christianity. It is situated in the Ararat Valley against the Biblical Mt. Ararat, where Noah’s Ark cast anchor on the bank of the River Araks on one of the high hills. 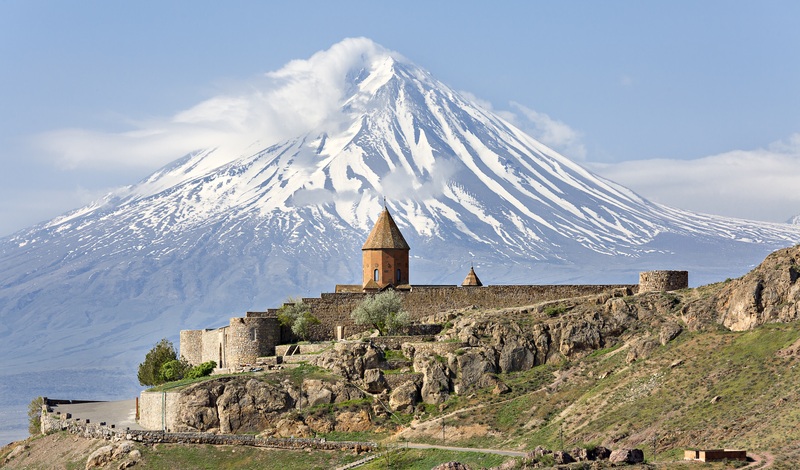 Weather permitting we will have spectacular views of Mt Ararat. We return to Yerevan where you have some much-deserved leisure time before tonight’s dinner at a classical Armenian restaurant, possibly with live Armenian music.